Two flying Abnormals land on the Sanctuary seeking Magnus' help; Will is temporarily blinded during a riot in Monrovia. Fan Question : In one episode you said Biggie mates every five years are we going to get to see a love interest for Biggie? Does he get some love ever? What can you tell us about it? Amanda : We're all desperate for a Season 5 aren't we? getting a little bit of action. RD : Damian said I'm going ... he co-wrote the episode I directed with James Thorpe, before the season even started he said I know which one I want you to direct, so just don't worry about it. I was kind of expecting it to be an easy-ish episode, you know the first one you start off you want to be given something that's not too difficult and it wasn't. It was like the exact opposite! I was in a ton of it, I'm playing myself in different versions of myself, like I'm playing myself when I'm 21 and there's flashbacks and I'm blindfolded for a lot of it. There's a couple of gunfights, there's a big cast. I read the script and I said Damian this is like, this is huge! And he says don't worry, you can handle it. And again it's having that.. the faith that they put in me kinda bolstered me up and I'm really happy with the end result. It was a phenomenal experience, phenomenal. Set dec pulled out all the stops for this scene! We swear we're not in Kansas anymore. #sanctuary season 4! AT: It’s a little frightening. But we both have really big episodes. The episode I directed was more action and explosions and stunts than I had ever dealt with. Most of the stuff on Sanctuary that I’ve directed has been very linear story telling and this is really outside of my comfort zone so it’s been quite fun. And Robin has been thrown completely into the deep end for his episode, which has massive viz effects and stunts and fights and prosthetics and insanity. First day of directing prep on #Sanctuary. Hoo-wah. Robin, are you ever going to direct? Robin Dunne: Funny you should say that. I believe I will be directing this season coming up. The Episode 6 of Season 4 I will direct, and I think that completely terrifies everyone involved in the show. But yes, it’s going to be exciting. I plan to show up every day to work in a bathrobe and use a megaphone to shout out my directions. But I think that’ll just be a good way to get everyone’s attention. Are you looking forward to getting back at everyone? 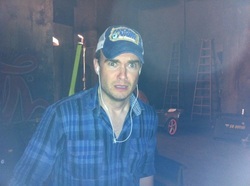 Robin Dunne: Yes. Oh, I have a list. The list. So, it’s like a phone book, and I am just going to - you know, Martin Wood and Damien Kindler are right at the top. So yes, it’s going to be exciting. No. But in all seriousness; it’s something that is scary, obviously since I’ve never done it before. But, I’m really thankful for the opportunity and you know I probably won’t sleep the first couple nights before, but it’s going to be a lot of fun. Amanda Tapping: He’s going to do a great job. One of the things when Martin, Damien, and I formed our company was we really wanted to foster young talent and mentor people into positions where they might not have had the opportunity before. So, we’ve had a lot of first time directors on our show. Our camera operator Steve Adelson, Lee Wilson directed for the first time. I’ve been given you know three different shots now. Amanda Tapping: Damien directing last year. And so when Robin asked it was like of course. This is what we do. And there’s a massive support network, but I think he’ll totally rock it.